I have often wanted to create video messages to accompany my books. I’m happy to present my first set of complete video sessions for my newest book Parents Rising: 8 Strategies for Raising Kids Who Love God, Respect Authority, and Value What’s Right. Each video is about 20 minutes long and is ideal for small groups, parenting groups, churches, and personal use. Feel free to share these videos with your friends and church. I decided to offer the videos for free so anyone could access this information easily! 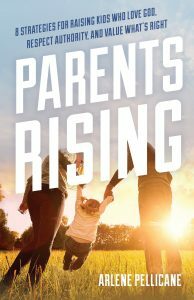 I encourage you to read the book Parents Rising to accompany the sessions to make the most of the experience. The book includes discussion questions to go deeper. You do not have to have a mediocre family experience that’s more frustrating than joy-giving. Things can change…and it starts with us as parents. It’s time to rise!